Skip to it! This shirtwaist dress pattern has a rounded collar and front placket detail. Pattern includes two styles. Short sleeve style features folded cuff with sleeve tab, slightly dropped waist, and self sash with belt loops. Long sleeve style features A-line shaping and bias trimmed patch pockets. Share your photos on Instagram with the hashtags #jumpropedress and #oliverands. Girl's dress. 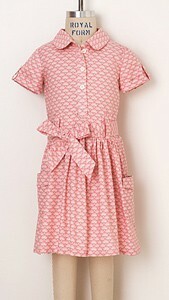 Shirtwaist dress features rounded collar andfront placket detail. View A includes short sleeves with folded cuff and sleeve tab, slightly dropped waist, patch pockets, and self sash with belt loops. View B features long-sleeves with folded cuffs, A-line shaping, and gathered bias-trimmed patch pockets. After successfully sewing this pattern, you will have developed the following skills: bias binding, buttonholes, collar, flat-set sleeves, partial plackets, and patch pockets. Light- to medium-weight woven fabrics like quilting cottons, broadcloth, lawn, shirtings, poplin, silk taffeta or dupioni, and linen. View A: Seven 3/8"- 1/2" buttons. View B: Three 3/8"- 1/2" buttons. Chest, both views 20 1/2" 21 1/2" 22 1/2" 23 1/2" 24 1/2"
Length*, view A 19" 20 1/4" 21 1/2" 22 1/2" 24"
Short sleeve**, view A 7 1/2" 8" 8 1/2" 9" 9 1/2"
Length*, view B 16 3/4" 18" 19" 20 1/4" 21 1/2"
Long sleeve**, view B 14" 15" 16" 17" 18"
Chest, both views 25 1/2" 26 1/2" 27 1/2" 29" 30 1/2"
Length*, view A 25 1/2" 27" 28 1/2" 30" 31 3/4"
Short sleeve**, view A 10" 10 1/2" 11" 11 1/2" 12"
Length*, view B 23" 24 3/4" 26 1/4" 27 3/4" 29 1/4"
Long sleeve**, view B 19" 20" 21" 22" 23"
Another incredibly adaptable pattern from Oliver & S! My grand girls are getting a little older and want more choice in their dress patterns and the material. This one was a hit with all 3, only indecision was the exact fabric to use! Too many choices! Igot this pattern a few months ago, but just used it. The pattern was easy to make and looks darling on my grand daughter. Lovely pattern with great options. 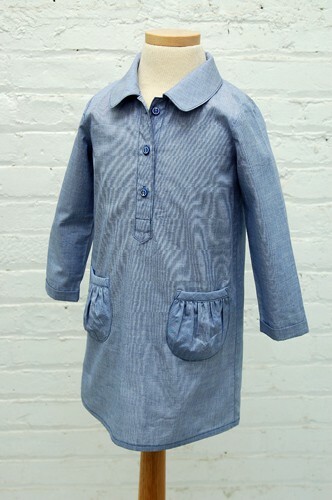 I made this in a light cotton twill due to a request from my granddaughter, who wanted a dress with buttons down the front, ruffles, pockets, twirly and with long sleeves since it is winter. Well, she is a sensitive skinned child and can't handle a lot of seams across her and does better in knits, but she also specified the fabric, Mike the Tiger, which I could only find in a twill. For her dress I made view B and extended the sides out from the armscye seam to about 12 inches on either side at the hem, to make it fuller (twirly). I made the placket, collar and pocket lining in white and added a yellow ruffle to the flap of the pocket and the collar, and it filled all the requests. 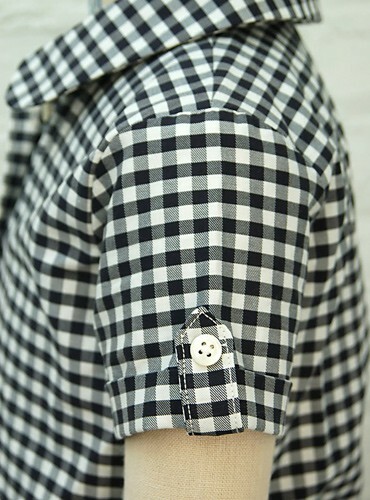 The pattern directions were very easy to execute, and the exact markings are a necessity to create a nice placket. I highly recommend this pattern. I have always been impressed with Oliver + S patterns, but this one kinda blew me away! GREAT details, very well written, and wow the design is amazing. Definitely one of my favorite patterns! 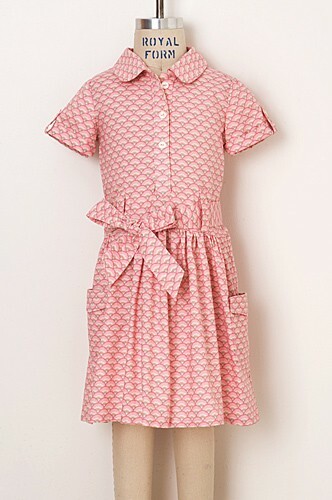 Jump Rope Dress - Great pattern! Very clear directions, as always with Oliver + S patterns. Learned new technique for creating the placket and it turned out perfect! Will definitely be making many more since my girl is only into dresses these days. The pattern is exquisitely drafted and you learn so many new techniques, that it is always a good investment to buy and O+S pattern. If anything, I would lift the waist around 2 inches, but I guess it is a question of personal taste. Highly recommended, a girly but not too girly design. I am so happy with this pattern! I was a bit intimidated, but so glad I tried this. The instructions were very clear and the dress came out beautiful. I will be making this dress again for sure! Copying Rachel's idea for my 10-year old's costume, I used the digital pattern in a pinch. It came together well, though next time, I'll drive across town and buy the paper version. The O+S papers feel better, and help me visually put the pieces together. I was thankful for the digital convenience with only three days to sew! My lean 10-year old did squeeze into the size 8. It would be great if this pattern went up to a 12. Overall, I enjoyed sewing this garment. The collar was beautifully crisp, and my 10-year old was beyond thrilled to wear her midwife costume! I made this dress for my 5yo daughter. She is long and lean, so I made the size 6 to get the length to fit and she has a little room to grow into it. I made view A with view B sleeves. I was a little intimidated by the 3 scissor rating as I am just recently getting more into sewing clothing. I'd never before sewn a button placket and button holes themselves had not been my friend in the past. The directions are so clear and well written and detailed, it turned out beautifully as long as I went slowly and made sure to understand exactly what the directions were saying before I began each step. Very happy with this pattern and will likely make again. I made this in a size 3 for my daughter and we both love it! I especially like all the details that make it a little more interesting and classy looking. The instructions were also clear and easy to follow. This pattern is wonderful. I made view B and I love the cute gathered pockets. It was one of the more time consuming dresses I have made, but I do like tha fact that each step is explained in detail. I made two dresses the same, two daughters, you know, so I have two chances to practice my new skills. This pattern is darling but I did not like having to purchase it digitally. I'm still piecing the pieces together and some did not print out plus it uses lots of paper and ink. I do t like digital patterns. The nicest girls dress you will ever make. This was my very first Oliver+S pattern and it was love at first sew. The classic placket front is splendidly explained and makes the construction perfectly straight forward. The tailored design lends itself beautifully to a school uniform. http://www.flickr.com/photos/motherof5/5481520682/in/set-72157625264790776 Once again it is a style that works equally well on a young child to an older girl. http://www.flickr.com/photos/motherof5/4985796734/in/set-72157625264790776 The neck opening can be a bit snug on a toddler so do check that on the smaller sizes if you think that may be an issue. I have used this pattern many times and will be sewing school tunics for my youngest with it again soon. A very special dress pattern. Enjoy! I've lost count of the number of times I've made this pattern. I know I 've traced both versions in every size up to size 6 and I'll be tracing size 7 tonight. Thanks for a great pattern! The Jump Rope pattern is one of my very favorites and I've made over and over. It's such a classy fit! Views A and B can give such a different look, and playing with contrast plackets or stitching really creates a dress tailor made for your special girl. The placket and collar instructions are excellent and such a confidence builder! Discussion on the digital jump rope dress sewing pattern from the Oliver + S Discussion Forums. Find and share more photos on Instagram using the hashtags #jumpropedress and #oliverands.